but had only photographed from a distance. did I pause to take a closer look. Looking up from the outside. surpassed by the Eiffel Tower and the Washington Monument. 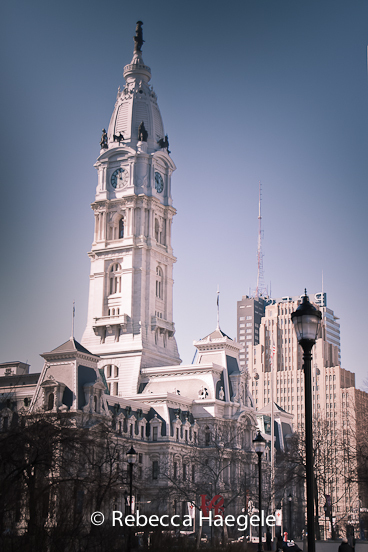 It remained the tallest building in Philadelphia until 1984.
an unwritten agreement that it was to remain the tallest building in Philadelphia. our brilliant government officials wanted to tear the place down. Chandelier in the Caucus Room. But at least City Hall was protected. hopefully protected from future governmental idiots. Things don't change much, do they? of William Penn looking out over the City of Philadelphia. the almost demolished City Hall out there? It truly is a magnificent building. Love that shot of the hand in particular. I've been there, but never gone inside, so I've never been to the top. I remember the 'great debate' when One Liberty Place was going to be taller and the seemingly endless debates on the pro's and con's. I think the view's just great! You certainly got some marvelous shots of this wonder. I especially marveled at those closeups of some of the detailed work. This is my first time here...thanks for the linky party! I have never visited the city of brotherly love. Would ♥ to though. That staircase shot is incredible. Wow, if only I could photograph like you Rebecca! What a stunning place to visit. I thought FSO was shooting down, soon you have a new meme? I think I have shooting up more than shooting down photos. Love the photos. They are so pretty.